Stephen Curry, whose been with Nike since his rookie year, will leave them for Under Armour when his contract ends at the conclusion of this month. This is a big move for Curry as he’s leaving a very successful brand to join a brand that’s trying to make its niche in sports. 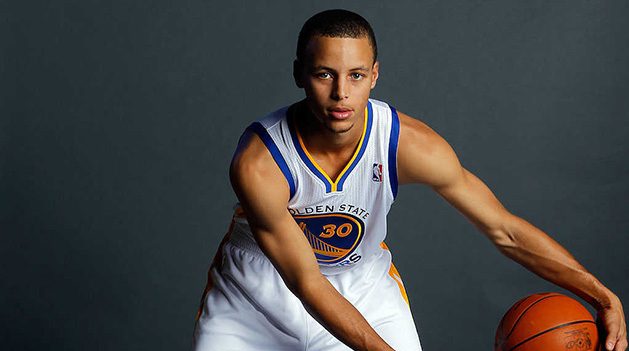 Under Armour is mostly known for football but with Curry, maybe basketball could be their next big step. UA already has several stars under their name including Brandon Jennings and DeAndre Jordan. The pressure will be on UA to market Curry well. I remember when Monta Ellis joined And 1 but because of Ellis’ off-field moped incident, that fell through. But for Curry, he has a bright future and hopefully the new shoes he wears provide his ankles some stability. It’s a big move for Curry and a risky one. But the reward can be great for him and UA. This entry was posted in Golden State Warriors, NBA, Outfitters, Uniforms & Design and tagged Stephen Curry, Under Armour. Bookmark the permalink.